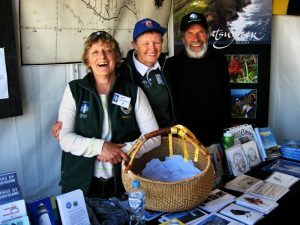 The three lighthouse island Wildcare groups – Friends of Deal, Maatsuyker and Tasman Island – will again have a presence at the biennial Australian Wooden Boat Festival. Located on Franklin Wharf, we will be tucked behind Mure’s seafood restaurant and next door to Ushi Iceccream. Go to https://wildcaretas.org.au/wp-content/uploads/2019/01/9.-Victoria-Dock-site-map.pdf to see our location at Site 5 on the accompanying map. We will be not far from the vintage machinery, so there will be plenty happening! Wildcare and the Friends groups are keen to spread the message about the joys of volunteering on some of Tasmania’s most spectacular islands. On display will be some photos of our conservation and restoration efforts as well as merchandise to raise funds for this work. It’s thanks to donors such as Pennicott Wilderness Journeys, Osborne Aviation, John Ibbotson, Paul Richardson & Amanda Walker, Marlene Levings, David & Trauti Reynolds, Tintenbar & Lark Distilleries, Grandvewe, Woodbridge Smokehouse and the Wildcare groups themselves, that there are some fantastic prizes in a raffle which will be run for the duration of the Festival. The winning tickets will be drawn on the last day. Help us in our fundraising efforts – you’ve got to be in it to win it! We’ll be there from Friday 8th – Monday 11th February, manning the stand from 9am until 6pm each day. See you there!